I had to make sure I wouldn't mess up my return journey after a big day. For some reason, I did not look at flights, but decided booked by a bus. Kerala RTC was chosen over other operators for the convenience factor - drop at Peenya! I picked my favorite service among them - Ernakulam-Bangalore Garuda King Class. The heat was taking a toll on me - I was exhausted by evening. After hurrying though routine pre-departure formalties, I rushed out of home to the nearest bus stop. The time was a little past 1915hrs - my bus from Thrissur was scheduled at 2045hs - leaving me with exactly 90 minutes to get there. I got to the bus stop by 1925hrs - missed a bus just before getting there. The wait for the next bus got a little longer - I was getting tensed as the time went by. I finally got into a bus by around 1945hrs - unusually, the driver decided to drive slowly. 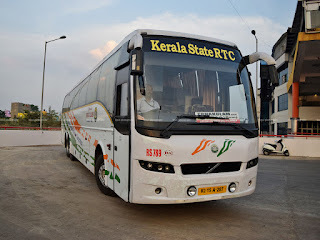 The heat got worse as I neared Thrissur - I got off near KSRTC bus station by around 2050hrs - five minutes past the scheduled departure time of my bus. The bus station was choked - as usual - people and buses fighting for space is a common sight every weekend at the busiest KSRTC bus station in Kerala. Half the ground was used by buses parked overnight, while the steady stream of departures were fighting each other to get a platform. I moved towards the fueling station - this is the airiest part of the bus station. 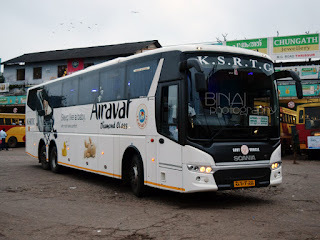 In the mean time, two Karnataka RTC Airavat Club Class buses working special services to Bengaluru joined the long line of platform seekers. The heat and humidity was unbearable - I just hoped my bus reached soon. As the clock ticked past 2110hrs, I had a bad itch to call up the crew to find out where they were - but didn't call, for some reason. Just as the clock ticked past 2117hrs, my bus to Bengaluru made its majestic appearance at the bus station - it was RS789 again, and I was excited to see the same crew as my inbound trip doing the honours. The bus directly headed to an empty platform, and boarding commenced immediately. I desperately wanted to get in, and joined the mob that was waiting to board the bus. Boarding was a little slow, as the crew had to search for some reserved passengers. We finally started off from Thrissur at 2130hrs - 45 minutes behind schedule. I was quite hungry by now as well - I took out my dinner that was packed from home, and finished it in no time. A movie was being played in the bus, as well. The driver was fast from the word go - perfectly the same style of driving that he had displayed on my inbound trip. Minimal honking, stable and well calculated overtakes were some of his highlights. We made swift progress towards Palakkad. The conductor was already receiving calls from passengers waiting at Palakkad - he patiently answered each one of them, and updated them that the bus would be arriving past 2300hrs only. 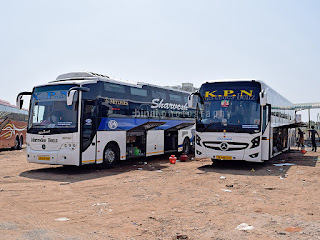 In the meantime, we passed Vadakkenchery and entered the 4 laned section - speeds stabilized now, and the bus remained on the overtaking lane most of the time. 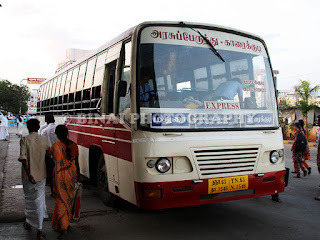 The bus did not stop at the regular dinner halt at Mangalam palam. We continued for some more time, and stopped at one Hotel Malabar, at Erattakulam closer to Alathur, at 2222hrs. I roamed outside the bus for a while - the crew finished their dinner quickly and were in back in the bus soon. We got moving by 2244hrs - a 22 minute break. We reached Palakkad bus station by 2307hrs - an hour and seven minutes behind schedule. Boarding was swift - the bus filled up here. We got moving by 2319hrs. I slept even before the bus reached back on the highway - I was exhausted, really exhausted. I had one nice, long - really long, sleep. I vaguely remember waking up in between - we were at some toll gate then. I continued sleeping thereafter. I woke up just as the lights inside the coach were turned on, and the conductor loudly called out for passengers alighting at Electronic City! We were at Electronic city by 0516hrs - less than six hours from Palakkad! We made frequent stops after Electronic city - the bus did not take the elevated highway (I really appreciate that). We made it to Silk Board by 0529hrs, and Madiwala by 0533hrs. We were really well before time. Roads were fairly free, and we could reach Majestic by 0553hrs - the bus almost emptied out here. We continued towards Peenya through Malleswaram - a group of passengers were dropped near Yeshwantpur TTMC (0607hrs), leave me as the sole passenger on board. The bus finally reached its terminus, Basaveshwara Bus Station Peenya, at 0618hrs - a whole 42 minutes before scheduled arrival time! Almost all the non-ac buses from Kerala had already arrived! I had to wait for a while for my cab to arrive - I still made it home before 0645, giving me enough time to take some rest before heading to work. 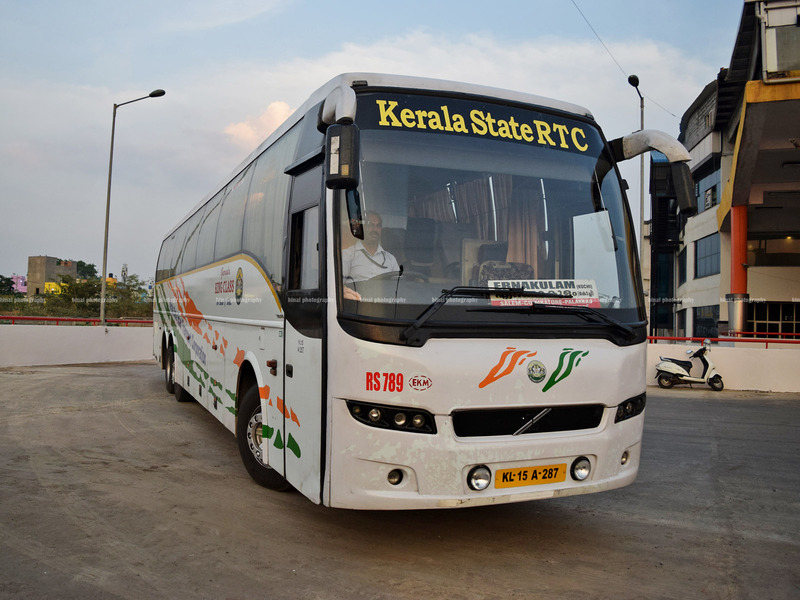 Remarks: The bus, RS789, homed at Ernakulam depot had clocked about 9.05 Lakh kms, close to about 2000kms more from my last journey in the same bus. We were 45 minute late while departing from Thrissur, but 42 minutes before time on arrival at Bengaluru! I absolutely loved the crew - perfectly cordial, soft behaved - the conductor went around checking if all the passengers received blankets, made sure he gave water bottles to all passengers who asked for one and ensured that the front curtains remained closed at night, setting a dark atmosphere inside the coach. The driver was stable - perfectly maintained pace, absolutely no honking at night and not a single harsh brake enroute. The end-to-end journey took 8h48m, including a 22 minute break for dinner - and the running time is till Peenya, and not Madiwala, which is the usual reference point. Absolutely awesome journey, and one that I would cherish forever!